LeRoy, the owner of D-One Ready, contacted us last week in order to get a website created. He wanted to have the ability to sell products and t-shirts regarding the D-One Ready mentaility. LeRoy moved very quickly to provide us the information needed to get his site online and fully completed. Today, we received the final updates and he has approved of the site! We appreciate the business from LeRoy! 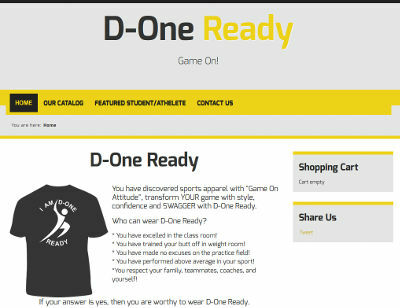 The D-One Ready website is at d-oneready.com.